There are at least 101 dog tricks that you can teach your dog. If you're looking for cool dog tricks, you've come to the right place! Our dog tricks list for beginners and list of advanced dog tricks are filled with some of the most unique dog tricks that we've taught our own dogs. You'll also find insanely helpful dog training tips for new dog owners and advice for training problem dogs that have behavior issues. Not sure where to begin? Start here --> Dog Tricks & Training Tips 101. Potty Training A Dog: Our Best Tips + Some Great Products That Work! All dog owners are going to find doggie accidents on the floor at some point. It always happens when you bring home a new dog — either an adult dog or a puppy. It also happens sometimes with older adult dogs that were once housebroken. Here are our best tips for potty training a dog. Want to teach your dog a dog trick? These videos show how to do some great dog tricks. 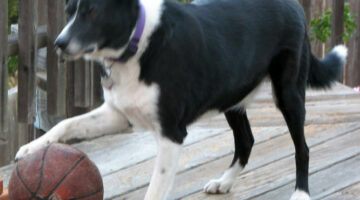 Start with easy dog tricks and then work your way up to the more difficult dog tricks. Before long, you may have your dog fetching your slippers! Have a fearful dog on your hands? Is your dog even afraid to play? Here’s how to help a fearful dog build confidence in themselves and become less fearful. Do you already have one dog in your house? Thinking of adding a second dog to your family pack? Here’s how to properly introduce the two dogs BEFORE you bring the new dog home. ‘Leave It’ – One Of The Most Important Dog Commands That Could Save Your Dog’s Life! One of the most important dog commands you can teach your dog is the leave it command. This video demonstrates exactly how to teach your dog to leave it. Once you have mastered the leave command, there are 101 other dog tricks you might want to teach your dog! While socializing dogs for the first time, you will want to make sure you have full control at all times, so make sure both dogs are on a leash. Here are 4 other tips to make socializing your dog even easier. Got a jumping dog? Tired of your dog jumping up on you every time you — or someone else — walks through your door? This video shows how to train your dog to stay down you will have a much calmer dog when you or guests arrive at your home. Avoid Having A Loose Dog On The Run By Training Your Dog How To Be Caught… Really! If you’ve ever had a loose dog on your hands, then you know how difficult it is to catch a dog on the run — especially a small dog. This video shows how you can actually train your dog to be caught. Really, it works! This video highlights the 5 steps that are necessary for teaching your dog to shake hands. Once you have mastered shake with your dog, you can teach him more fun tricks from these 101 dog tricks! This video gives a couple great tips that should keep your dog from running away from you each time he is off the leash. Plus 101 fun dog tricks you can try! Looking for a way to train your dog to stay off of the furniture? Here are a few ideas. 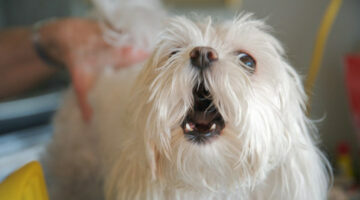 Plus tips on how to deal with dog fur. 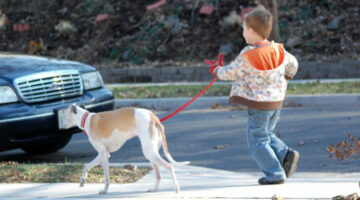 How To Train Your Dog To Walk On A Leash… Without Pulling! 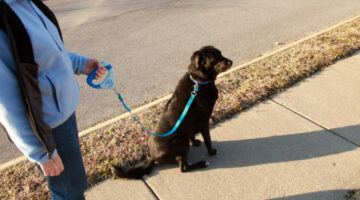 Looking for a way to keep your dog from pulling the leash when you’re on a walk? Here are some tips. Plus why you should always maintain eye contact when you’re communicating with your dog. 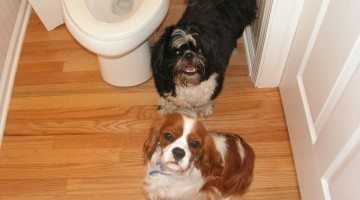 Raising 2 Dogs – And Training 2 Dogs At Once – Is Not Easy! There are a few issues that may arise if you bring home more than one puppy at the same time. Plus, here are some tips for finding a playmate for your current dog. Win 3+ Hours of Dog Training With Cesar Millan! Want to win 3 hours of dog training with the Dog Whisperer, Cesar Millan? Well, now you can! How & Why To Socialize Your Dog – It Might Be The Most Important Thing You Do! A well-socialized dog will be much more relaxed in the world and less likely to have unwanted behaviors. Socializing your dog — as a puppy — is definitely a win-win for both you and your dog!